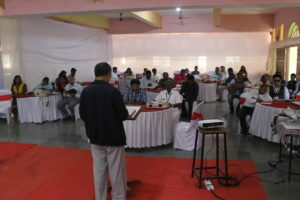 This institute initiated a discussion for the first time on the following issues: Re-productive Health Care to the visually and intellectually challenged adolescent girls, Sexual Abuse of the Visually and Intellectually Challenged, Disability infanticide, Caste (Dalit) and Disability, Disability Economics, Social Protection of PWDs, Disability Bio-ethics, Gender and Disability, Marriage and Disability, RPWD Acts and their implementation. 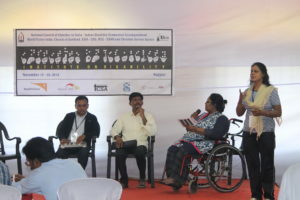 It was encouraging to note that some of the participating organisations and individuals have committed to work on PWD concerns in their expertise fields, and some of them already in action. Dr. Sara Varghese, National Director of the Cristobel Blind Mission (CBM) delivered the key note and invited the participants, churches and NGOs to work towards inclusive communities through their ministerial and diaconal interventions. Dr. Sara further emphasized the importance of affirming and facilitating the right of PWDs to participate in the community and to have public access through pastoral care, theological articulations and policy developments. 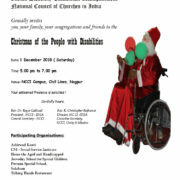 Mr. George Abraham, the Chief Functionary of Score Foundation, and the Director of the Eye Way, emphasized the need to have accessible and inclusive churches to ensure the participation of PWDs in the very life and work of the churches by creating disabled-friendly environment and by developing disabled-friendly worship resources. Ms. Esther Mwai of the World Council of Churches – Ecumenical Disability Advocates Network introduced and informed the participants about the UN framework on Disability Convention and its importance in establishing just and inclusive communities. 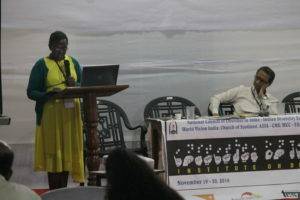 Further, she also shared about global ecumenical and theological responses to Disability Concerns, particularly through the life and work of the WCC – EDAN and how it facilitates the Churches, Ecumenical Councils and Theological Fraternities in ministerially and diaconally addressing the issues of disability. Rev. Dr. Roger Gaikwad, President of the NCCI -IDEA and the General Secretary of the NCCI inaugurated this Institute. Rev. Asir Ebenezer the NCCI – General Secretary Designate greeted the participants. Along wit the key note speakers Rev. Dr. Saji Lukos, the President and Founder of the Mission India Theological Seminary wished his best for the institute. Rev. R. Christopher Rajkumar, Director, NCCI -IDEA and the Executive Secretary of the NCCI – Unity and Mission introduced the institute with words of welcome and organized this institute. 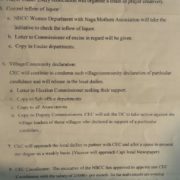 Mrs. Lalremsiami, a Volunteer of the NCCI -IDEA assisted in coordinating this institute along with Ms. Jenifa Rani, Deacon Yeshudas Pandit, Mr. Jeswin Rajan, Ms Pranita Sandela and Ms. Megha Naik. 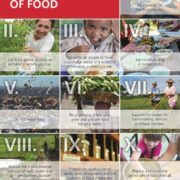 Working with CBOs, Human Rights Organisations, PWD Organisations and Government Agencies. Churches, Theological Colleges and the Ecumenical Organisations to work on articulating Disability Theology by PWDs. 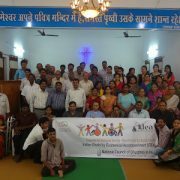 Parents, siblings and care-givers to set ministerial and diaconal agenda towards developing disabled-friendly and accessible congregations and communities. Together, all shall involve in advocacy and lobbying to affirm the PWD Rights to Worship and Public Access (including worship places) by identifying and mobilizing communities through awareness and sensitization initiatives and by integrating and mainstreaming disability concerns. Many of the participants testified that this institute was an eye opener in terms of dealing with some of the crucial and needed concerns for the first time and challenged the participants ministerially, theologically and diaconally. The Institute also provided information on relevant, modern and innovative approaches in the care-giving sector. This institute also facilitated a collegiality among the participating organisations on cross-learning and cross-fertilization. Further, this institute facilitated an understanding of the inclusive nature of God through a re-reading of the scriptures. Through this Institute, the NCCI recognized the life time contributions of Dr. William Stanley and the Rev. Chandra Mohan to the Church and Society at large. 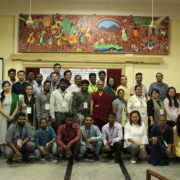 Dr. Stanley was remembered for his contributions towards organizing empowering the Indigenous, Dalit, women, fishing communities and other marginalized communities including the people with disabilities though the community based diaconal interventions for the past 5 decades in the remote areas from Mizoram to Kerala. Rev. Chandra Mohan contributed towards empowering the Dalit, women, indigenous fishing communities and facilitated congregations and the Churches to be in solidarity with them. Both have represented Churches in building communities of hope and gave a new vision for border-less Church for the past 50 years.